World Wide Web creator marks its 25th anniversary by calling for a “free, open and truly global internet” enshrined in a "bill of rights"
World Wide Web creator Tim Berners-Lee (pictured) has launched a campaign calling for a “free, open and truly global internet” to mark the 25th anniversary of his invention. Berners-Lee has been an outspoken critic of government surveillance following the revelations by whistleblower Edward Snowden. The issue can be compared to the importance of human rights, he told the BBC, calling on people to protest against surveillance. 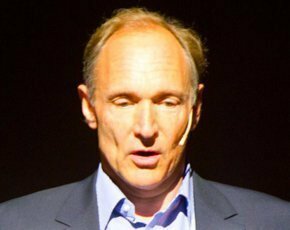 Berners-Lee said the internet should be a neutral medium that can be used without feeling that "somebody's looking over our shoulder". He said he believes an open and neutral internet is essential for open government, good democracy, good healthcare, connected communities and diversity of culture.